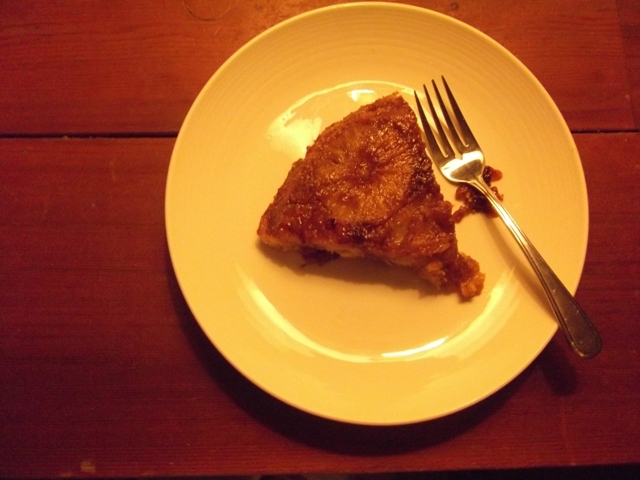 It was plum season when I wrote about upside-down cakes, and I mentioned then that you would want to try making upside-down cakes with oranges in the wintertime. I love being right – and with oranges baked in caramel, how could you go wrong? On an unrelated note, the lighting in my apartment continues to be terrible, despite my best efforts, so even with my shiny new camera the photos are turning out yellow. If this is something you can solve for me with a simple explanation (Fuji FinePix JX250, in the hands of an unskilled clicker), I will love you forever AND be your best friend. When I got home from work I was too tired to do anything about feeding myself, so I slumped onto the couch with a can of room-temperature PBR and watched RapCity while Nick made merely adequate grilled cheese sandwiches for dinner. For an hour or two I was resigned to an evening of staring blankly at the TV with my mouth hanging open. Then Nick went out to play boardgames with his boyfriends, and I felt repentant for my earlier uselessness but also disinterested in washing dishes or bending over to collect his socks from the floor, so I made a cake. 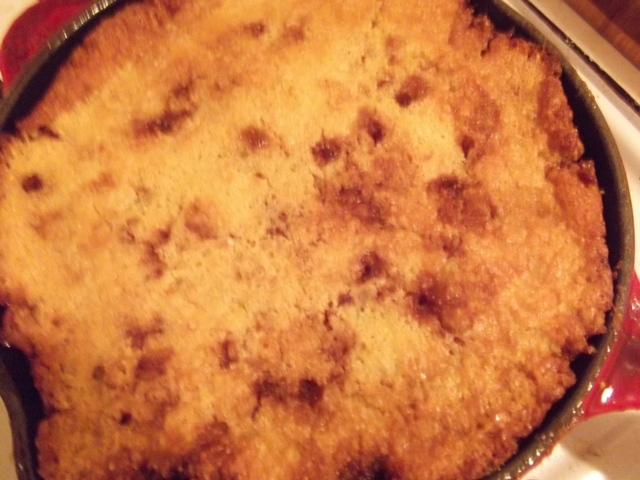 This is a variation on October’s upside-down cake, as I’ve decided that cornmeal is what I am in the mood for. You could make it with the other cake if you want, but the yellow of this version is nice, and the citrus in the batter brightens it up enough that you’ll almost forget you haven’t seen sunlight in a month. It’s just about healthy, with its corny base and orangey top, and something about it tells me it will be as satisfying reheated for breakfast tomorrow morning as it was fresh from the oven tonight. Using a knife, peel your oranges. Cut slightly on the diagonal, running the blade along the flesh of the orange, being careful not to leave any of the bitter white pith behind. 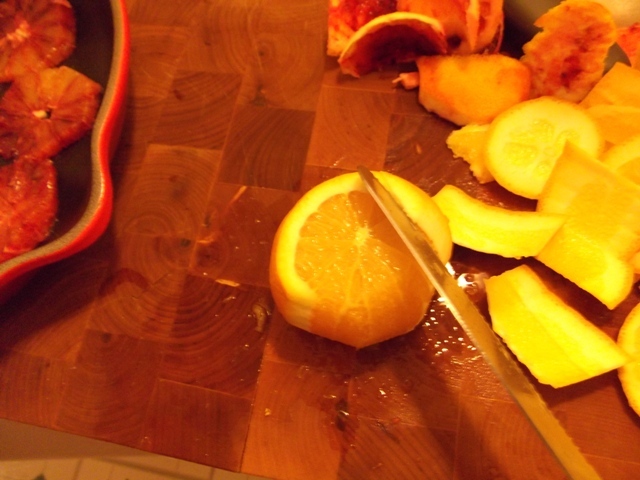 Slice oranges horizontally to about 1/4″ thick. Test to be sure they fit into the bottom of a 9″ cast iron pan; they should fit comfortably with only nominal overlapping. Set aside. In a bowl, combine orange and lemon zests, cornmeal, flour, baking soda, and salt. In a separate bowl, whisk together lemon juice, melted butter, honey, milk, and the egg. Place the 9″ cast iron pan over medium high heat, melt butter and sugar together until bubbling. Turn the heat off, and carefully add orange slices, placing them evenly across the bottom of the pan. Whisk wet ingredients into dry ingredients, and pour into pan on top of the butter-sugar-orange mixture. Bake for 25 to 30 minutes, until top is golden, edges appear crisp, and caramel has bubbled through in places. Let stand five minutes, then carefully turn out onto a serving plate. Let cool for 15 minutes before serving. PS – Lisa over at Sweet as Sugar Cookies asked me to share this at her linky party. Since I like parties and adjectives that end in “y,” I said yes. Go check out her line-up of awesome desserts! < Previous Lentils with bacon. Next > Thank you again. And now I need your happy thoughts for someone else. I’ve never had an orange upside down cake before. It sounds like a fantastic and delicious idea. I bet that juice really soaks down into the cake and flavors it through and through. I have a linky party on my blog every week called “Sweets for a Saturday” and I’d like to invite you to stop by this weekend and link this up. Sounds so interesting and so delicious! Really nice. That looks delicious and what a great idea. I love cooking with blood oranges, but I never used them in baking. Stopping by from Lisa’s Sweet Saturday. I heard pineapple up side down cake a lot, but this orange one is such a new and creative idea. My hubby doesn’t eat pineapple but love orange! I guess I’ll be making one REAL SOON! Thank you so much for sharing. 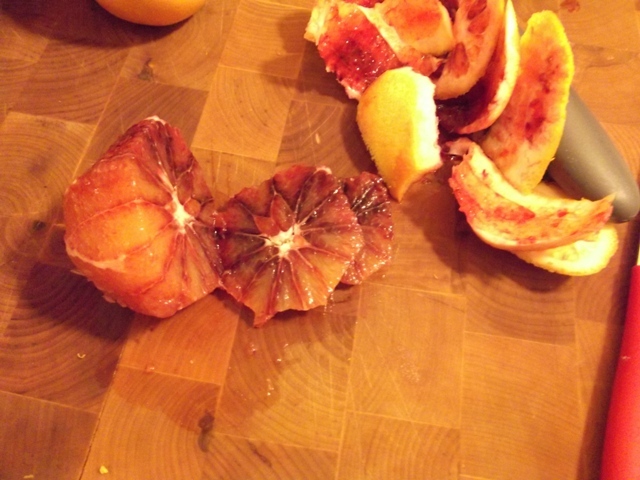 I’ve been wanting to try something with blood oranges – perfect timing! Re: photos with yellow tint – try adjusting the white balance option on your camera. Play with all possible settings they give you on that and see what you come up with! I’ve never made an upside down cake before. Your post has reminded me it’s something I should try. Thanks for the inspiration. This looks yummy! I second Mango’s suggestion to check the white balance on your camera. While my pictures still aren’t as good as I would like, this little change made a HUGE difference. Caramel + orange = win. With my SLR and its fancy white balance options, I still I have a hard time taking decent pics at night. One thing I’ve read is that a good detached flash will make a difference (despite that rule of never using a flash with food), but “good” means over 200 bucks so I won’t be getting one real soon. Thanks everyone – I hope you do try it! I’ve been kidding myself that eating slivers of cake every so often isn’t nearly as bad as just eating several whole pieces, even though the slivers add up. Mango and Candy – I’ll figure out this white balance thing! Thanks for the suggestion. Dani – yeah … I probably won’t be getting one anytime soon either. At least it’s getting lighter now, so it won’t be dark at night for too much longer! Ooooohhhhhh! That looks completely wonderful! It was! I finished it today, and used the excuse of Vitamin C to excuse my gluttony. Win! 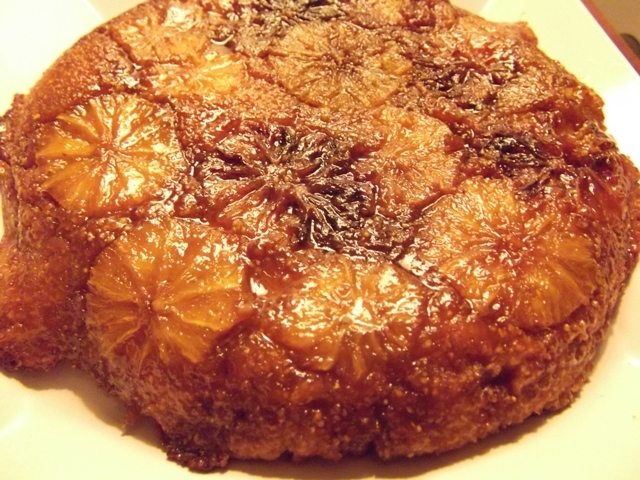 I just found your blog and I LOVE the concept of an orange upside down cake! Beautiful photographs, too! Thanks so much for linking this up to Sweets for a Saturday. I hope you had fun and will join me again next week.